VICTORIA – Sierra Club BC hailed today’s decision of the Federal Court of Appeal on the Trans Mountain pipeline expansion as a major victory. “It’s time for Prime Minister Trudeau to walk away from this pipeline and tankers project. Today’s decision should be a lesson to politicians: your days of being servants to multinationals and fossil fuel corporations are coming to an end. We will no longer wait for climate justice. “If the Trudeau government takes its commitment to reconciliation and the United Nations Declaration on the Rights of Indigenous Peoples seriously, then these rigged and superficial approaches must become a thing of the past. Indigenous peoples have the right to free prior and informed consent. “The decision making processes have been rigged for too long. It’s time for a more modern, democratic process that subjects projects like this to much closer scrutiny, especially of the many environmental, social and economic dangers they pose. “Today’s court ruling is a victory for orca whales, for our climate, for Indigenous peoples defending their title and rights, and for the rights of all of us to defend the land and waters we love and call home. “We are thrilled that the courts have overturned federal approval of this dangerous pipeline and tankers project that would have put so much at risk. Orca whales are one of BC’s most iconic residents. Besides being supremely lovable, with their high degree of intelligence and powerful family bonds, they are also a keystone species that upholds a delicate marine ecosystem, one that human beings intrinsically depend on. We need orca whales and we adore them, but very few people are as outwardly devoted to them as Gary Sutton. Gary is a captain for Ocean Ecoventures, a small, family-run whale watching company in Cowichan Bay. He’s also a gifted and hard-working photographer with a driving passion to photograph and protect these whales. 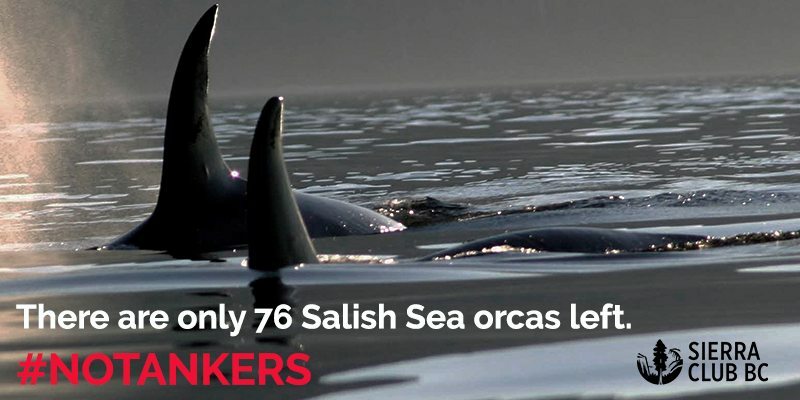 There are only 76 southern resident orcas remaining in the Salish Sea, and these endangered whales face numerous obstacles to their survival. Now, they face their greatest threat to date: Kinder Morgan’s new pipeline and tankers, which would surely sound their death knell. 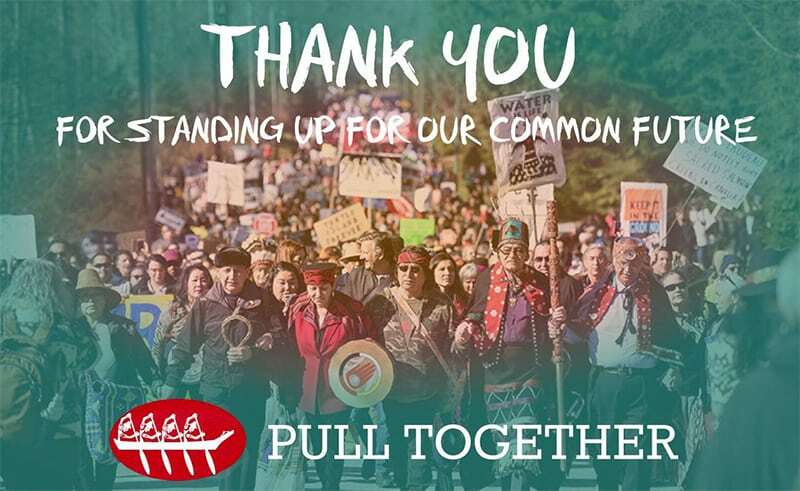 We’re working hard to stop Kinder Morgan through our Pull Together campaign and we hope you’ll join us in supporting First Nations’ legal challenges to the project. 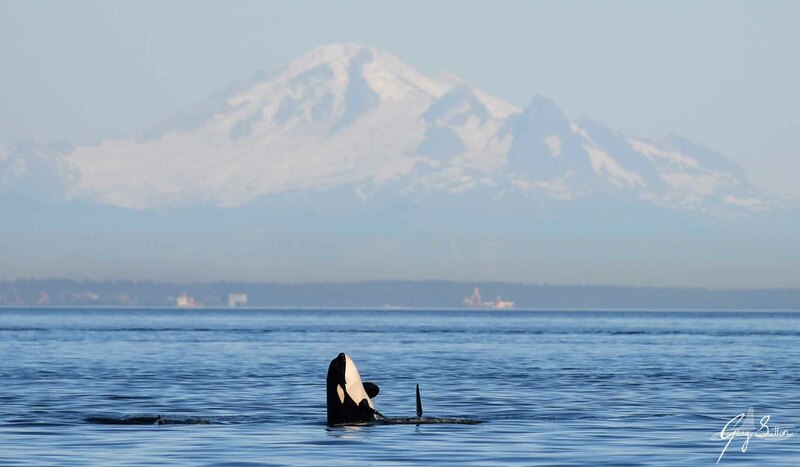 An orca whale pops its head out of the water with Mount Baker in the background. Photo by Gary Sutton. With Kinder Morgan bullishly pushing ahead with construction at their terminal in Burnaby and laying down illegal mats to prevent salmon from spawning (Chinook salmon are the southern resident whales’ primary food source), our outreach coordinator Brynne Morrice thought it would be a good time to hear Gary’s perspective on orca whales and the battle for their survival. B: Thank you for joining me Gary. First—how did you become a captain on a whale-watching boat? G: I moved here ten years ago from Ontario to pursue a career in marine biology. I have been obsessed with whales and dolphins—particularly killer whales—my whole life. So when I finally lived in a city that offered whale watching tours, I jumped at the chance. I applied for marine naturalist jobs and was lucky enough to get hired by a company on Granville Island. I fell in love with it almost immediately. My boss offered to pay for my 60-ton captain’s course. I started driving the boats and then took over management of the company as well. I have since moved to Vancouver Island to work with Ocean Ecoventures, a small, conservation-minded company that really goes the extra mile. B: How has your role as a captain related to your journey as a photographer? G: Photography was never part of my life until whale watching became part of it. After my first season in 2007, I bought a camera to document some of the incredible things I got to see out there. It quickly became a passion. Whale with Vancouver in the background. Photo by Gary Sutton. B: It looks like you mostly photograph orcas. Is this primarily because of your job, or is there a more personal reason? G: Mostly because of my job, but also because I love them! It’s such a challenge to capture an intimate moment of an animal that spends the majority of its life underwater. It requires you to study and learn their patterns and movements so you can have your camera pointed in the right spot when they surface again. I love that challenge. B: When I first chatted with you, you said you want to fight for these whales in any way possible. Tell us more about that. B: There has been controversy about whale watching boats in the past, and again more recently with the federal government changing “viewing distance” laws. Can you break this down for us and address the issue of boats and killer whales? G: Where to begin? Shipping noise needs to be addressed. However, it has to be done in conjunction with the most important factor, which is lack of salmon. The government’s announcement that they were putting over $7 million into acoustic research and just over $1 million into salmon enhancement is embarrassing. A recent study showed that the vast majority of harmful noise that could interrupt their foraging comes from commercial shipping. It’s obvious why the government is so focused on noise. They want to conduct studies so they can find some (most likely non-peer reviewed) science that will allow them to expand tanker and freighter traffic in and out of Vancouver. I am all for a viewing distance law for boats, both commercial and recreational. Again, more needs to be done than just that. Other studies have shown that it’s the speed of the vessel that impacts the whales way more than the distance. My frustration grows when you see the whale watching fleet going 5 knots paralleling whales at 100m with enforcement boats on scene watching us, and there are freighters going by at 15-20 knots lighting up the whole area with harmful noise and at the same time recreational fishing boats sit right in front of the whales, still being allowed to scoop chinook salmon right from their mouths. It’s great that there will be a law so DFO can prosecute when you see really bad behaviour (mostly by pleasure boats). However, it’s disappointing that this is the only action the government has taken. We have already seen this on the other side of the border. After implementing a 200-yard viewing distance for whale watchers 5 or 6 years ago, how do the southern residents look now? Lowest number of whales in 30 years, no calves for years, poor body condition, and this was the least amount of time the whales spent in the Salish Sea since the study began in the mid 1970’s. Whale in the water near the Port of Vancouver. Photo by Gary Sutton. B: Tell us about how the Kinder Morgan pipeline and tankers project relates to these whales. G: The Kinder Morgan project would be a huge loss for the whales, wildlife, and ultimately, us. An oil spill in the Salish Sea would finish the southern residents. We saw that happen in Alaska when the Exxon Valdez went down. The AT1 transient population of killer whales in that area only have a few animals left now, with no reproductive females. They are doomed for extinction. This is a real possibility for our whales if Kinder Morgan goes through. It’s not worth the risk! There’s also the salmon streams they are destroying while building this pipeline, the leaks from the pipeline and the increased noise from the 7X increase in tanker traffic. I understand fossil fuels are a huge part of our world, but if we want to be a progressive country we should be heavily focused on renewable energy and not increasing our exports of oil. B: You’ve gained quite a following on Instagram with your spectacular photographs of orca whales. How has this had an impact for you? G: Instagram has been a great platform to share information about what is going on out here. It’s also a great place for me to vent. It actually really makes me feel hopeful when you see how many people are engaged in this fight and willing to help. Most of the time, it’s not that people don’t care, they just don’t know. B: For people who care about orcas in the Salish Sea, what would you ask them to do? G: I encourage them to make small changes in their lives: Reduce your waste (especially plastic), eat sustainably, use responsible cleaning products, support sustainable fisheries or stop eating meat altogether. Politically, vote for your local representatives that have environmental conservation in mind. Write letters to Canada’s fisheries minister letting him know you don’t agree with the government’s actions and you want to see more fish in the water. Get rid of fish farms. Put a moratorium on Chinook salmon fishing. B: Thanks for your time, Gary, and for your dedication to the whales. You can follow Gary’s whale photography on his Instagram, or visit his website at www.garysuttonphotography.com. Feature image by Gary Sutton. Both our federal and provincial governments have given the green light to Texas-based oil company Kinder Morgan to build a tarsands pipeline and increase oil tanker traffic on the BC coast by 700%. Despite what Premier Clark says, BC is a long way off from having “world-leading” spill response capacity – on water or on land. Accidents happen and there’s no known technology to clean up toxic diluted bitumen. 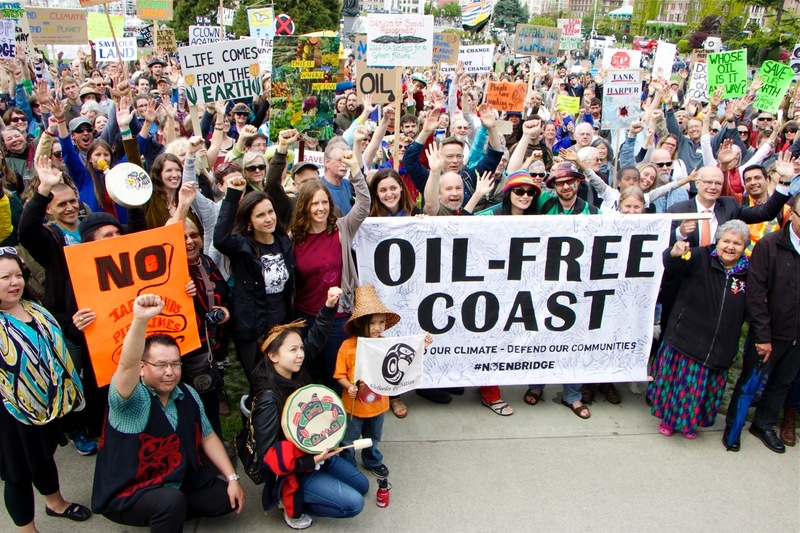 Our elected representatives are standing up for Big Oil, so it is up to the rest of us to stand up for BC and defend our communities and our climate. A number of First Nations along the pipeline and tankers route have already filed court challenges. It was indigenous-led legal challenges that brought an end to Enbridge’s Northern Gateway proposal. First Nations can stop Kinder Morgan in the courts also. Let’s not stand by and watch them go it alone. That’s why we’re relaunching Pull Together. 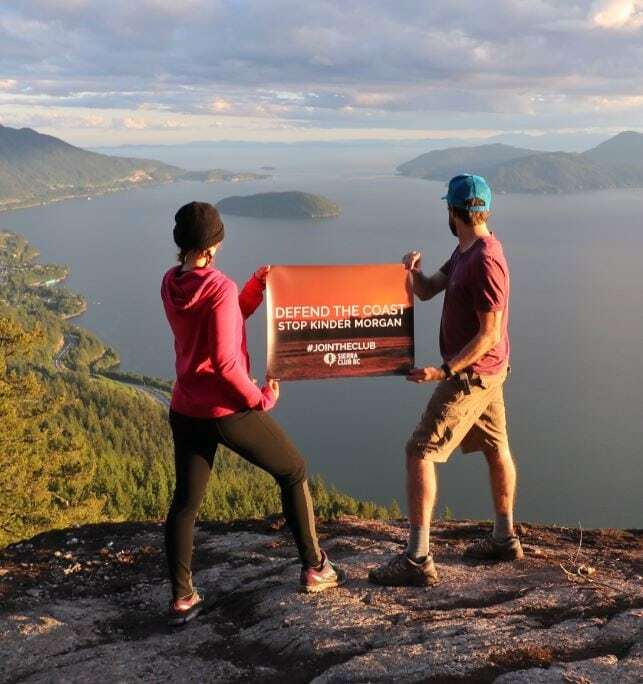 In partnership with RAVEN Trust and the Force of Nature Alliance, we’re supporting the Tsleil-Waututh and Coldwater Nations who are in court to overturn the federal approval. There are lots of ways you can help. During our last Pull Together campaign, there were smoothie sales and pub nights, dance performances and poetry readings. Over fifty musicians played at benefit concerts across the province. Will you host a solidarity event in your community? It doesn’t matter how big or small – whether you raise $100 or $1,000, your impact will be amplified by the contributions of others. We can help get you started. Just fill out this form and we will be in touch to provide you with support. 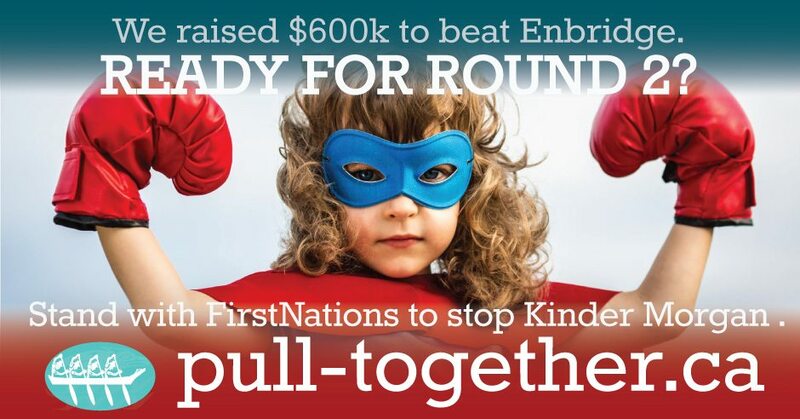 When we pulled together to stop Enbridge, we were overwhelmed by your response. All across the province, people stepped up. People like you danced, marched, sang, paddled, stretched and ate together to support the First Nations fighting Enbridge in court. Together we raised over $600,000 for the legal costs, thanks to unprecedented solidarity between Indigenous leaders and thousands of Pull Together allies. Not a penny of the money raised went to Sierra Club BC. This campaign is a risky one for us financially, however we feel so strongly that it’s the right thing to do that we are doing it again! We believe that standing in solidarity with First Nations requires the courage to take risks and step outside our comfort zone. We hope you will join us. Your ongoing support is what lets us take this kind of risk. And your involvement in Pull Together is how together we will stop Kinder Morgan. 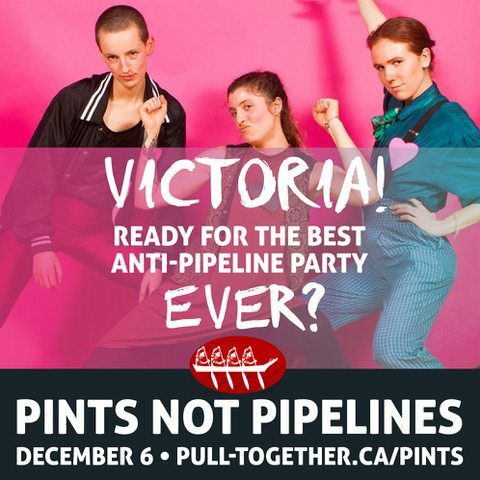 Pull Together is not just about raising money, it is about pulling together in the face of governments bent on forcing the Kinder Morgan pipeline and tankers on an unwilling province. Pull Together is about building strong communities of resistance. Pull Together recognizes that when it comes to moving away from fossil fuel dependence, we are all in this together. With Trump pushing his fossil fuel agenda, it’s all the more important that we organize here in BC to keep fossil fuels in the ground. By stopping Kinder Morgan, we can build the type of future we want in British Columbia—one that moves toward renewable, clean energy and green jobs. One in which our communities are safe from the threat of oil spills. Together, we can do this. Ready, set, pull! Thanks to you and so many more like you all over the province, we did it! After years of tireless, selfless struggle—organizing, marching, petitioning, writing submissions and speaking at NEB hearings, getting spied on by our own government’s security apparatus, raising funds for First Nations legal challenges, you name it—we finally got what we were so passionately demanding: the end of Enbridge. Our salmon—and the northern economy that depends on them—are now safer, as are the spirit bears, the humpback whales and all the delicate ecosystems of the north coast. This, my friends, is a legendary achievement. Take time to celebrate, to savour the taste of victory. Don’t let the government’s reckless, irresponsible approval of the Kinder Morgan pipeline and the Petronas fracked gas plant undermine this victory – tomorrow we will work to stop Kinder Morgan and Petronas, today we celebrate! To every one of Sierra Club BC’s incredible supporters: thank you. To every one of you who contributed to Pull Together: thank you. To the communities along the pipeline and tanker route who led the way for so many years: thank you. To every one of our friends and allies: thank you. And most especially, to every one of the First Nations who stood resolute and strong in the face of the wealth and might of corporate and government power: thank you. In particular, I want to name the Heiltsuk, Gitga’at, Gitxaala, Haida, Kitasoo-Xai’xais, Nadleh Whut’en, and Nak’azdli Nations, whose court cases overturned the federal approval of Enbridge and whose precedent will push governments in the right direction for years to come. It was a privilege to witness their courage and determination and to support them (along with RAVEN Trust) through the Pull Together initiative, which raised more than $600,000 for legal costs. Theirs was true leadership and their example has shown us a path to victory in the coming fight to stop Kinder Morgan. I believe that when historians look back at the death of the Enbridge pipeline, they will come to see it as the beginning of the end of the fossil fuel era in British Columbia. There’s still much work to be done. Clearly, we have a federal government that doesn’t understand you can’t be a climate leader and build pipelines. Clearly, our provincial government, with its obsession with liquefied fracked gas, still doesn’t get it. But this was a landmark moment, make no mistake. History is on our side. The end of fossil fuels is inevitable. The only question is when we are not just celebrating the end of a pipeline, but the end of an era. The Enbridge victory, above all, gives me hope. It shows the power of everyday people. It shows what we can achieve when we come together. It shows the path to the kind of future we all want: one powered by truly clean, renewable energy; one that respects nature and lives within her limits; one that respects indigenous governance; and one that makes sure no one is left behind by a post-carbon world. Take some time to celebrate! Just look what we can do, when we stand together. I am filled with hope for what we will do next. We stopped one pipeline, we can stop another one.